With her pioneering natural movement dance technique, free-flowing clothing and bare feet, and rejection of the conventional Victorian lifestyle, Isadora Duncan was truly an emancipated woman ahead of her time. Her influence continues to be felt in modern dance. Isadora Duncan is currently considered a "single author." If one or more works are by a distinct, homonymous authors, go ahead and split the author. 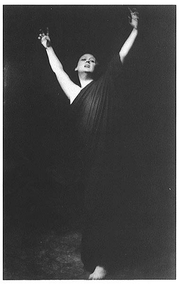 Isadora Duncan is composed of 3 names. You can examine and separate out names.